In July 2016, Wits’ School of Economic and Business Sciences produced a report on the hotly debated issue of a national minimum wage. It was the result of a series of working papers commissioned by the “National Minimum Wage Research Initiative” at the university. Here we produce an edited summary of that report. Minimum wages establish a wage floor. No employers are permitted to pay below that floor to employees who are covered. According to the International Labour Organization (ILO), the purpose of minimum wages is to ensure wages are able to cover the basic needs of workers and their families. A national minimum wage sets a single economy-wide wage floor. In South Africa, it could be a tool to reduce inequality and transform the inherited apartheid wage structure. Striking Public Sector workers in 2010 demanding a living wage. 1. A single national minimum wage covers all workers and is easier to enforce. 2. Sectoral systems generally set lower minimum wages in sectors with large numbers of vulnerable workers. A national system would not do this. 3. A national minimum wage can be set to take account of broad policy objectives such as reducing inequality as well as the economy-wide impact of the policy. A sectoral system only considers the narrow issues in each sector. The report shows that a national minimum wage in South Africa can reduce working poverty and inequality. But it can only do this if it is set at an appropriate and meaningful level. This is extremely important as South Africa has the highest level of inequality in the world, and dire levels of working poverty. In 2014, the average income of the top 10% of full-time employees was 82 times the average income of the bottom 10%. Inequality in South Africa is driven by wage differentials. There is a growing international consensus that inequality retards economic growth and undermines social cohesion. In South Africa 54% of full-time employees – 5.5 million workers – earn below the working-poor line of R4 125, and so they cannot meet the most basic needs of themselves and their dependents. In addition, wages in South Africa stretch to cover many dependents. So higher wages for low-wage workers would benefit both the employed and the unemployed. 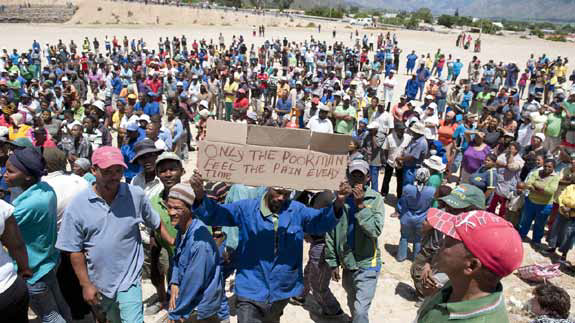 Striking farmworkers in De Doorns express the reality of the lowest paid. • 90% of domestic workers below R3 120. The report lays to rest the myths of the Free Market Foundation and its friends. It shows that a national minimum wage can also support economic growth. The Free Market Foundation constantly claims that minimum wages create unemployment. The report shows clearly that, while minimum wages on their own do not increase employment levels, they do not necessarily decrease them. In fact, a national minimum wage can be implemented without significant employment effects. These findings are supported by an extensive international literature, which shows the success of minimum wages in reducing poverty and inequality without negative employment impacts. They are also supported by the statistical modelling undertaken for South Africa itself. 1. Companies, and the economy as a whole, adjust to higher wage costs through a variety of mechanisms. 2. Higher wages – particularly for lowincome households – can spur positive growth and stimulate demand. Minimum wages have been successful at raising wages for low-wage earners in both developed and developing countries. In Latin America, a 10% increase in minimum wages led to an increase in average wages of between 3% and 6%, with low-wage workers benefiting disproportionately. In South Africa, minimum wages of between R3 500 and R5 500 would raise average wages over ten years, in real terms, by between 21% and 38%. The result would be a rise in household income, particularly for lowwage workers. The household-income growth rate could double. This would spur greater consumer spending and so increase output and raise levels of growth, together with rising productivity. In South Africa, output is projected to be 2.1% higher with a national minimum wage (beginning at levels between R3 500 and R4 600). The average GDP growth rate is projected to be 2.8%-2.9% instead of 2.4% without a national minimum wage. Minimum wages have directly reduced inequality in the formal and informal sectors across Latin America, and in Indonesia, Russia, China, India and Europe. Raising the coverage or level of minimum wages can also cause a shift in income from capital towards labour. This is also shown to be beneficial to the overall South African economy. Given that poverty lines and minimum wages are close together, rising minimum wages have also reduced poverty in almost all developing countries studied; in Thailand and the Philippines, for example, a 1% increase in the minimum wage has been shown to reduce poverty by 0.5%. In South Africa, the poverty headcount is projectedto fall by around 2%; the decline is greatestfor black South Africans. The international literature shows that the effect of minimum wages on employment is very small or statistically undetectable. 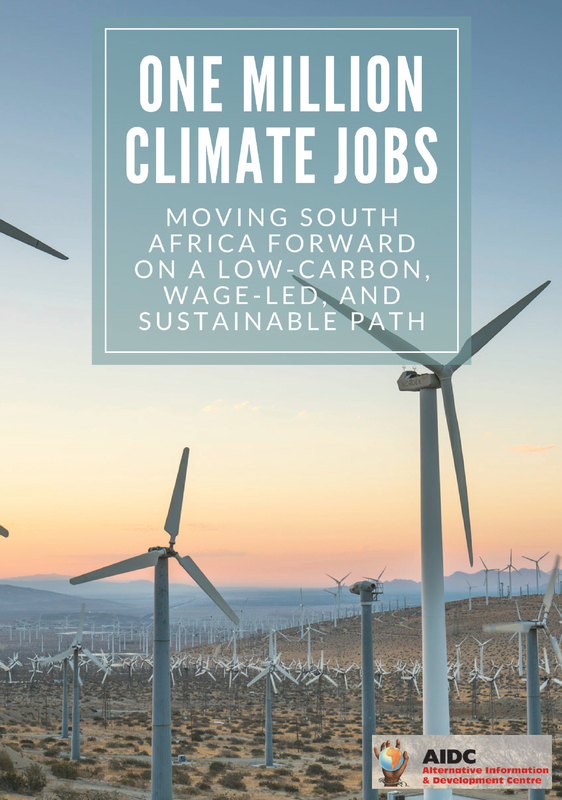 In South Africa, minimum wages have been shown to have no significant impact on employment in five of the six sectors studied; agriculture is the exception. In addition, the increase in demand from higher wages acts against any negative pressures on employment levels. While raising wages may place pressure on individual businesses, it can be benefical to businesses overall. How much should the minimum wage be? • Average wages: in middle-income countries, minimum wages are on average set at 48% of the average wage; this translates into R4 161 (in April 2015 rands) in South Africa. • Existing collective bargaining agreements: in 2015, the average minimum wage for private-sector bargaining councils was R4 355. For public- and private-sector bargaining councils it was R5 747. • Poverty lines: in April 2015 a family of four required R5 276 to meet their most basic needs and not live in poverty; the working-poverty line was R4 125. These three benchmarks therefore sit between R4 000 and R5 500. The report concludes that the national minimum wage policy must be carefully designed and the wage set at a level that is able meaningfully to improve workers’ livelihoods with sustainable ramifications for the wider economy. It can reduce poverty and inequality, while boosting economic growth, without significant negative economic consequences. This has been achieved in other countries. It can also be achieved in South Africa. 1. Whilst a minimum wage is clearly desirable, on its own it will not make a big dent in the triple crisis of poverty, unemployment and inequality. 2. Without a concerted struggle, the level of a national minimum wage will be set so low that it will achieve almost nothing. The government, under the direction of Cyril Ramaphosa, has recently set up a panel of economists to come with a proposal on a national minimum wage. This comes after a Nedlac process deadlocked. 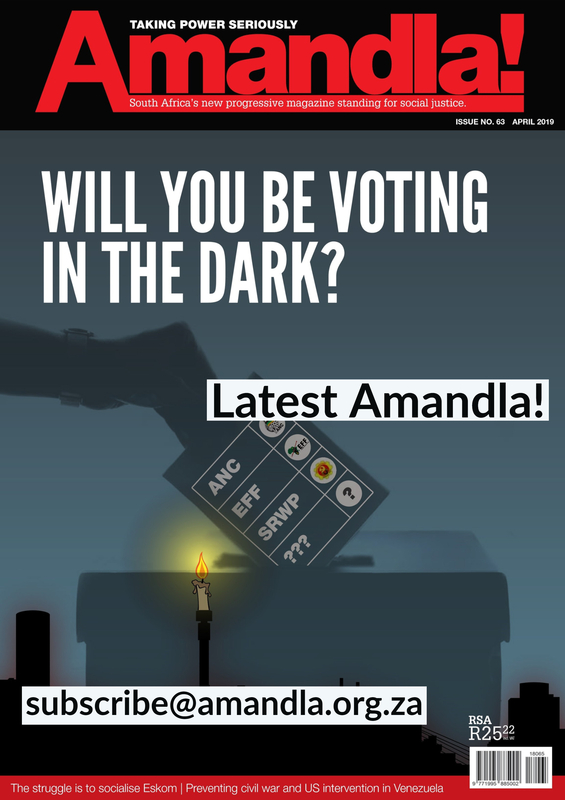 As the Business Day reported: “The state has proposed a floor of between R2,000 to R3,000 a month, business about R1,800 – or a floor close to the lowest sectoral determination, to make it as broad as possible – and Cosatu between R4,125 and R5,276.” This shows that an effective minimum wage will come from a concerted struggle by workers, not from any panel of economists.